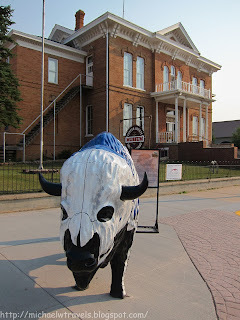 While driving through Custer, SD I noticed life-size buffalo statues on many street corners along Mount Rushmore Road. Each buffalo was painted in it’s own unique way. When we arrived in Custer we didn’t have much time to stop and check out the statues. We were in a bit of a rush. We wanted to relax for a bit, grab dinner and get back to Custer State Park to drive the 18-mile Wildlife Loop. The moment I saw the buffalo they reminded me of a couple of similar art projects (charity auctions) that I had seen in the past. I remembered seeing the Cow Parade in New York and on our visit to Boston, Kim and I had fun wandering around and taking photos of their Cow Parade. Here are a couple of buffalo that we stopped to take photos of. If we had more time I’d definitely have quite a few more. Here is my favorite buffalo that we saw in Custer. Not only is the artwork amazing- I love the skeleton design. The story behind the design was also really interesting.